Home » Video Blog » Moonlight and a Turgwe River Pool July 2018. 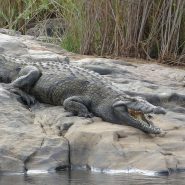 This is one of the Turgwe River pools where the hippos share their home with the crocodiles First we introduce you to the moon and a lion and baboons calling at night at Hippo Haven, then you meet a grey heron water dikkops and the crocs on their rocks. Hope you all enjoy. Love Karen and the hippos.